Ken Klisz, the 2006 Southern California PGA Section Clubfitter of the Year and the PGA Director of Instruction and Driving Range Manager at the Tustin Ranch Golf Club, in Tustin, California, a GRAA Top 50 Public Facility, speaks about using ToughLie 360 for uneven lies and as staff inspiration. At Tustin Ranch Golf Club we currently have one ToughLie 360. For context, our facility is a semi-private golf club, with 1,200 members located in Orange County, California. I purchased a ToughLie 360 for the purpose of adding variety to my instruction. Six PGA Professionals, including myself, use this product on a regular basis for our lessons to provide an authentic learning opportunity for students to practice from uneven lies. Our staff incorporates the product into lessons 4-5 days of the week. The advanced golfers at our facility were excited when the ToughLie 360 arrived, and immediately recognized the value and how it could help their game. It’s not uncommon for some of the college golfers to ask me if they can go practice their uneven lies when it’s not being used for instruction. We host corporate clinics on occasion and I find ToughLie 360 useful during the full swing segment. It allows me to add variety to the clinic by covering the fundamentals of uphill, downhill, and sidehill lies all in one spot. 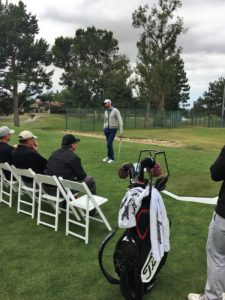 We had PGA Tour Professional Cameron Tringale at one of our corporate clinics and he was intrigued by the product. 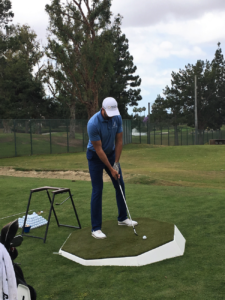 It’s become evident to me that advanced and elite golfers appreciate the unique practice opportunities that ToughLie 360 provides. When I am teaching a beginner about uneven lies, I focus on overcoming what I call the “opposite effect.” When faced with a downhill lie, natural instinct tells us to resist and distribute our body weight on to our left side, against the slope. I try to highlight the importance of fighting this “opposite effect” and get the student comfortable leveling their shoulders with the slope and distributing their weight to match the slope. Explaining this to someone is not particularly effective, as in most scenarios they don’t have the opportunity to actually match the feelings with my verbal instruction. However, with the ToughLie 360, students are immediately able to put my instruction into action. Ultimately, ToughLie 360 helps simplify the transition from range to course for golfers. There are a lot of challenges that golfers struggle with on the course, one of which is undoubtedly uneven lies.